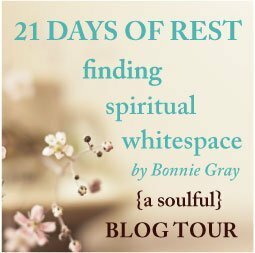 Rest: When Did it Become a Four Letter Word? Click here for pinnable image and more. Are you kidding? Who Me? One daily battling Fibromyalgia. Plagued with chronic fatigue and insomnia by a disease that steals rest. (Who knew these would be peas in my pod?) Body wracked with pain. Mind on overload. A student studying Christian Care and Counseling through Oral Roberts University. A writer slowly writing her first book. A woman with a dream wondering how you go from disability to possibly working again, and your healing has not manifested yet. A broken girl who is on the long road to soul healing from childhood sexual abuse that battles Dissociative Disorder and P.T.S.D. And the mom of little girls home from school for the summer. We are all here wrapped up in this woman who just longs to sit at Jesus’ feet to drink from the well of living water. And guess what? She is frozen there in her boat. She can’t row no more. All the world wants something from her, but she is running on empty. They define her and others by what they do, and she just wants to be. Crying out wanting only Jesus. And suddenly He softly whispers through the pages of a new book by my sister friend across the miles, Bonnie Gray. So pondering her question I consider what is downstream. What is waiting for me if I just let the boat drift and stop worrying so much about all the world. That’s where Jesus is calling me to rest. To drink in His presence. To just be and not do. To have my broken heart bound and the balm of Gilead applied to my wounds. And this woman weary from rowing. She wants to run. Run toward a destination she has been avoiding. She surrenders her doing so she can be alone with her maker, redeemer, healer, and friend. Where heaven meets earth. So the blog has slowed down for the summer. The posts will trickle from a cup running over once a week. Maybe I will share a word or two from my journey downstream. While I take a deep drink from the well of rest. 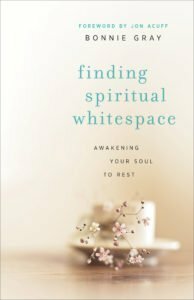 And I wonder if you couldn’t use a wee bit of “Spiritual Whitespace” in your neck of the woods.